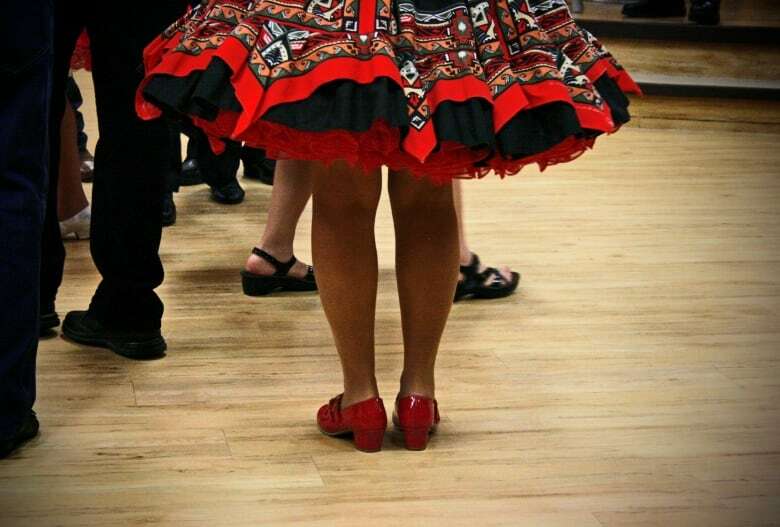 A central Alberta square dance club wants to ensure their favourite steps do-si-do into the next generation. Fewer people are signing up and dance halls across the province are emptying out. “The problem is, they don’t want to commit,” said Dave Kurney, the caller for the Leduc Square Dance Club. “If you’re going to learn to square dance, you should be here every night, or as many nights as you can. If you miss a night, you miss some moves. With membership dwindling, the club is opening its annual fundraiser, a big dance dinner called Homesteader Night, to the public for the first time. After more than 35 years of operation, the club had one of it’s leanest years. At one dance last winter, they had so few people they could barely fill one square. Kurney joined in 1988 and is one of the club’s longest standing members. Most nights, you can find him calling the dances, singing out “circle right” and “Allemande left” at mind-jumbling speed. After his introduction to square dancing at a particularly lively barn dance decades ago, he began dancing seriously 30 years ago. He’s been calling dances for 24. He has travelled the world through square dancing, working as a guest caller at dance halls from Portland, Ore., to Fairbanks, Alaska, and from Saskatchewan to B.C. “If you go to a big city on business and you’ve got nothing else to do, look up the number for square dancing groups, they’ll come pick you up, feed you and bring you home,” he said. Kurney met his wife at the Leduc square dancing hall, seven years ago, on her first night there. Doreen Kurney joined the club with her daughter and son-in-law, and had two left feet. She decided to approach Dave for some dancing advice. “My son-in-law was too shy to go and ask, so I thought, ‘I’ll go ask him,’ ” she said. “We needed help on the star-through move. So apparently when I went up there, he said, ‘That’s the one I’m going to marry,’ ” Doreen recalled. Both had lost their first partners a few years before and were ready for a little romance. “We had fun and one thing led to another, and a year later we were married,” Doreen said. Even if square dancing doesn’t find you the perfect romantic match, Kurney said it’s guaranteed to provide “good company,” get you moving and keep your mind sharp. “It’s a good workout mentally and physically,” she said. “You have to learn to listen and know the moves when he calls it because it’s not in any pattern. After her first “very intimidating” year as a square dancing novice, Doreen now dances both the male and female parts, so she can always find a partner. She wears a silk sash embroidered with the word “man” to help ease the confusion of fellow dancers. Another regular on the dance floor is Rick Power. He has been square dancing on and off for 55 years, since he was 11 years old. “I’m getting a little older now. Getting a little slower,” he said. Power comes from a square dancing family. His mother was an avid dancer. He remembers his father calling dances all over the province, even singing out for people who used to dance on horseback. He got back into dancing after his mother died in 2006. At her funeral, which was attended by hundreds of square dancers, he realized there was something special about it. “There was an awful lot of people but there was very few walkers and wheelchairs,” he said. “Like I said, it’s good exercise. A little bit physical, a little bit of mental. Not too hard on the knees. Doreen is confident square dancing will have a renaissance among the next generation. “We need people to keep the whole system going,” she said. “The new folks are too busy, it seems. They do this, they do that, and they never stick to one thing. She would love to see more young people join them on the dance floor. “The bottom line is, have fun, you don’t have to be perfect. Homesteader Night takes place on Nov. 10 at the Telford Centre. Tickets are $25 and can be purchased from the club.